I have two projects that I did a while ago but never got around to posting. I have to admit that I am somewhat of a “stick it in the drawer” type of gal. sales I found these two pieces for a few dollars that I thought would be perfect for my office/craft room. The first one got a coat of ivory paint. I added the numbers using carbon paper and a Sharpie. give me the extra storage for all my craft stuff. Thank you to everyone that entered the Shabby Apple giveaway. The winner of the Da Vinci dress is Andie @ Divine Theatre. Congrats Andie! Shabby Apple is still offering a 10% discount to my readers. At check out use the code nominimalist10off for the discount. 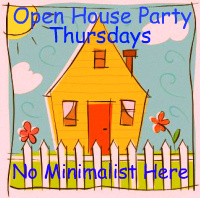 Please join the Open House link party starting tonight (Wednesday). See you there! Sherry I love you newly finished storage bins, so creative. The new paint and lettering makes all the difference!Congrats to your winner! What?? 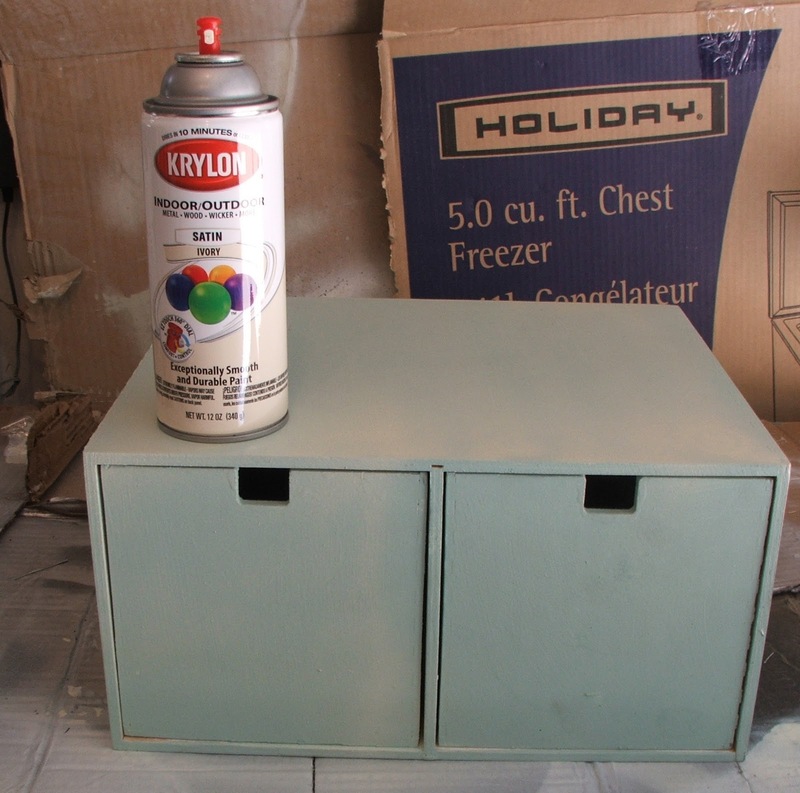 You only have junk drawers in your kitchen? I have them in every room that has a drawer lol. I have to clean out my kitchen drawers before they come to put in the new granite. I would be sooo embarrassed if someone pulled one open and saw inside. Love your storage, looks great! So cute! Aren't Sharpies great? We have several junk drawers here, too! 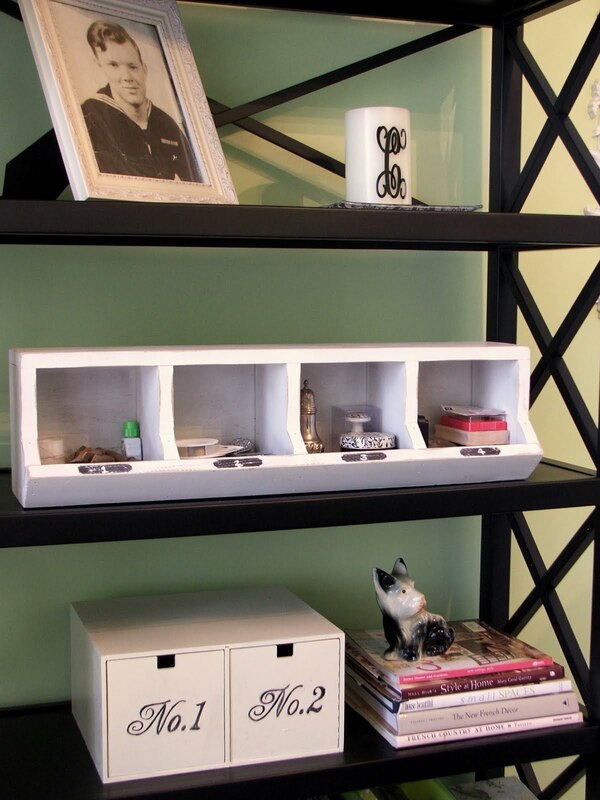 I think your little organizer cabinet looks perfect on your very organized shelf. You have reminded me that I need to get on the stick and get things organized around here! LOL. Great stuff Sherry! These looks great painted and with the numbers! Congrats to Andie…I am so happy she won she deserves a pick me up!! I love easy and cheap! Your two projects with numbers are adorable! What a great idea to just use carbon paper and a sharpie. I think I have been doing things the hard way 🙂 Thanks for sharing! Congrats to Andie…but I so wanted that dress! Ah well…I guess I'll have to order one for myself! 🙂 Very nice storage pieces! Love how you updated them and made them so cute! We have kitchen junk drawers too…and no matter how often we clean and organize them, they quickly become junked up all over again! I am always so impressed by the many inspriational projects in blogland that I see come to life..so impressive and creative!! You tickle me! You even have your junk glamorized!!! I love them. Thanks for linking to THT. 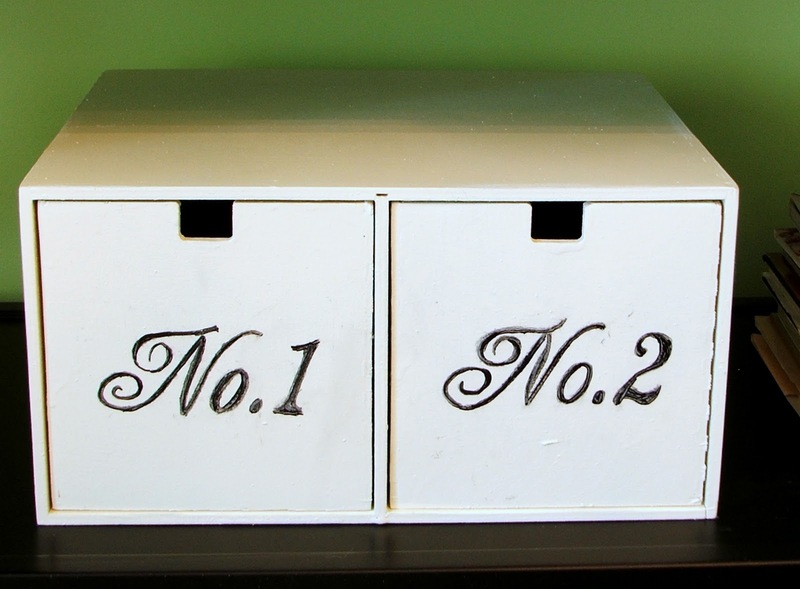 Love the box labeled No.1 and No.2. nice font! Really cute Sherry! I love doing little projects because it's almost instant gratification. They look great on your shelf. Love those projects!!! Gotta find something to do similar..LOVE LOVE LOVE!!! Love your project. And that silver shaker for glitter is such a wonderful idea. Great job! Thanks so much for stopping by Lulu's and commenting. I'm a long time reader/lurker of your blog! I'm so far behind on reading because of Round Top, but I can't wait to sit and read for a spell! I love these numbered boxes! Thanks for stopping by Thrifty Like Me! I love that you have glitter in an old silver salt shaker! That is too cool. very cute makeovers. Thanks for linking it up! The salt shaker/ glitter shaker is a really awesome idea! I'm sure it only throws out a little at a time, too, which is perfect for little hands. Love it! Hopping by from the Creative Bloggers Hop. Love your blog! 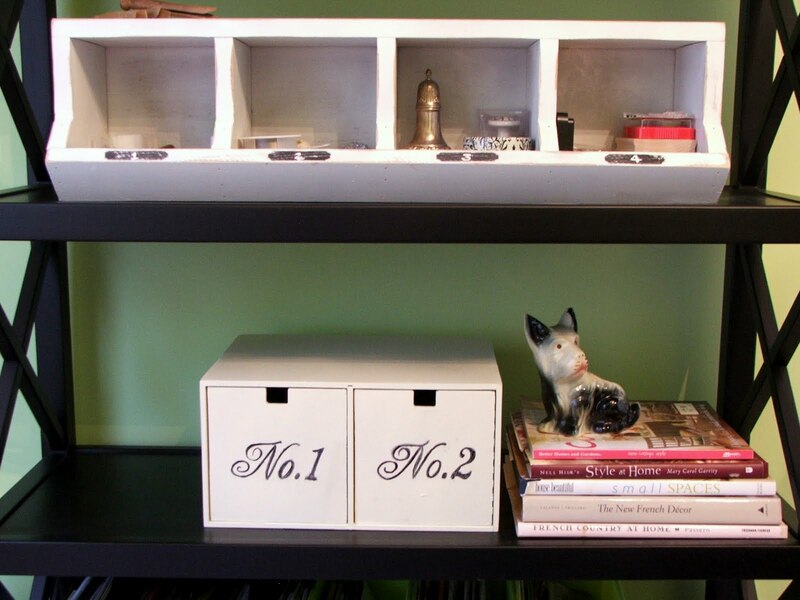 You are so talented and now you'll be organized (if you weren't already) with those great shelves! Hope you can hop by my blog too! Thank you for dropping by our blog again and becoming a follower! We are so excited and honored to have you join us! Storage is such an issue for crafters. 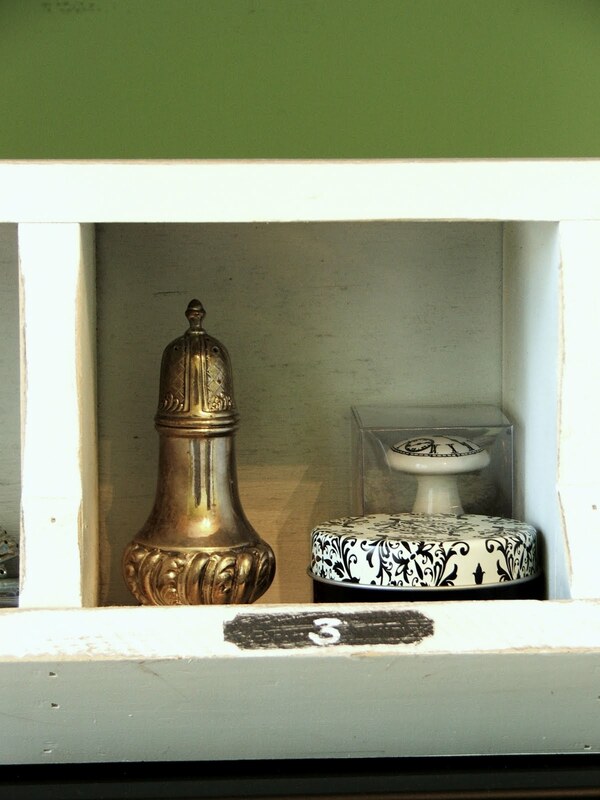 I love your ideas, especially the idea of adding the decorative numbers. They look great! I'm going to be on the lookout for some pieces like yours!